Israel Defence Forces attacked two military posts of the Palestinian movement Hamas with drones on Sunday in the Gaza Strip in response to riots along the border of the seaside Palestinian enclave. 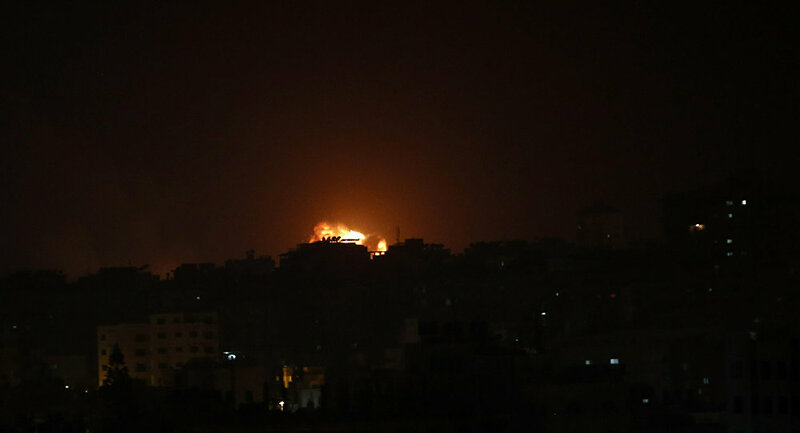 "In response to numerous explosive devices that were thrown and exploded in the area of the security fence during clashes at the border, the Israeli Air Force aircraft struck two Hamas observation posts in the southern part of the Gaza Strip," a military communique said. 2/ HEAR: The sound of explosions heard by Israeli families who live minutes from the Gaza border. ​Tensions between the Israelis and the Palestinians near the Gaza border have been mounting since March 2018, which marked the beginning of the Great March of Return, a movement which sought to draw attention to Palestinians who were forced to flee their homes amid the creation of the state of Israel. Palestinian sources claim that during this time, about 270 Palestinians have died and more than 25,000 have been injured in clashes with the Israeli military on the border. In turn, Israeli authorities have been blaming Hamas for Gaza residents' aggressive actions toward Israel. These protests were met with deadly force; an independent Commission of Inquiry, set up by the UN's Human Rights Council last year, said Israel killed 189 people and shot more than 6,100 others with live ammunition near the Gaza fence, according to The Guardian.